I opened a ticket at the Second Life support pages, and waited for response. I’m still waiting, but the login is working again. So if you get this message on login, please be patient and try once again a few minutes later. I’ll get in contact with Linden Lab and hopefully solve this issue. Addendum: This was a kind of technical issue and was solved in minutes. The problem never arose again since then. 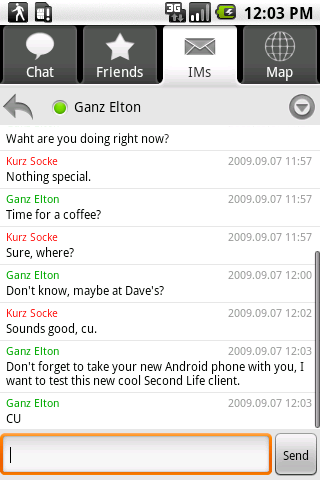 Mobile Grid Client (originally known as My Second Mobile Life) participates at the Android Developer Challenge 2. So if you like this application, please judge it high. So we can invest even more time and money into the development of it. 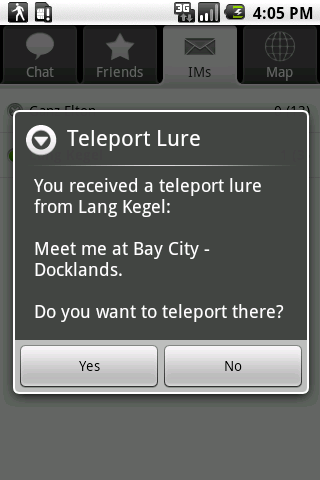 This is the fist Second Life client for Android. It’s designed for people who always want to be present in Second Life and in contact with their friends. 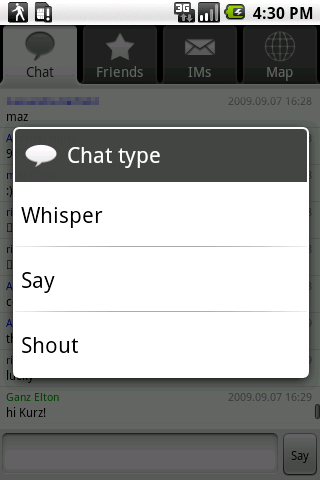 This first version allows you to receive and send chat messages, instant messages, friendship and teleport offers. Additionally it shows you a small map representing the region you are logged in. Receiving instant messages also works when the phone is in standby. Future versions will bring more features like viewing avatar profiles, a list with all the avatars next to you, search for avatars and land, localization and more.